Please join us for an evening of beautiful music. Carla Jenkins and Steve Giordano have been collaborating on a repertoire of original songs that are lyrical, cinematic and evocative with lush and exotic harmonies. Carla’s enchanting and sensuous voice is a jewel in a trio setting of guitar, bass and drums. 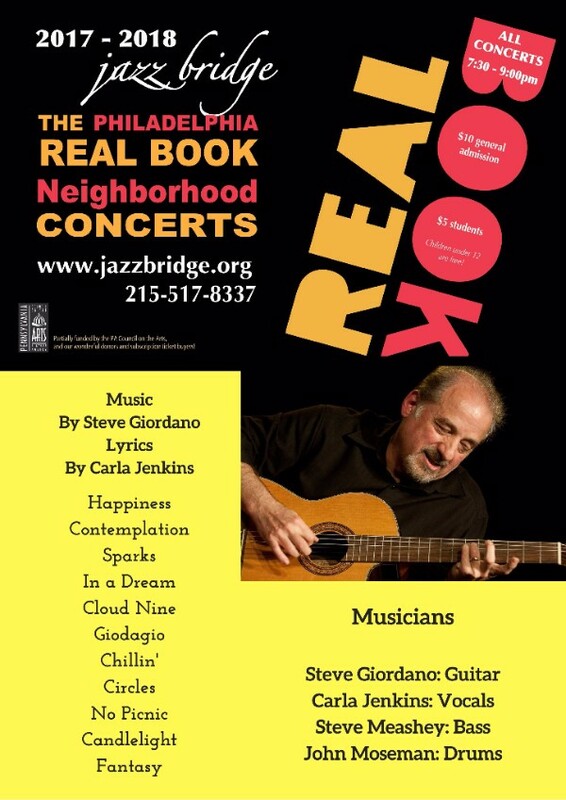 Jazz guitarist, composer and educator, Steve Giordano has been a driving creative force in the Philly area for many years. He will be joined by musicians, John Mosemann on drums/perc and Steve Meashey - acoustic bass, who have worked with him for many years. This is reflected in the fluid creative interactions and joyful spontaneity that infuse their playing at every level. Carla’s technical prowess allows her to effortlessly interpret Steve’s intricate and profoundly beautiful melodic lines. She also wrote most of the lyrics to the songs. We would love to see you there! Please don’t miss this wonderful opportunity! As a special promotional gift, we will be giving the first 50 people who attend this event a limited edition pre-release of our upcoming CD of our latest upcoming recording to be released this Fall. The addition of Bob Meashey (trumpet) and Marc Adler (flute) as we are playing Marc's 2 part horn arrangements of this beautiful music. All content © 2016 by Steve Giordano unless otherwise noted.